If you’re a serious fan, coach or participant in prep track, you’ve probably seen some of the amazing things Chanelle Price has done the past few years. Maybe you saw her gun for the 800 national record at Nike Outdoor in mid-June, wowing the crowd in Greensboro as she ran the first sub-2:03 (2:02.76) by a prep in 25 years, making a courageous attempt at the 2:00.07 from 1982 held by the late, legendary fellow Pennsylvanian Kim Gallagher. Maybe you watched her race the senior women at USATF the next week in Indianapolis – you rarely see preps in senior middle-distance events – and hang on for 2:02.38, becoming #3 all-time. 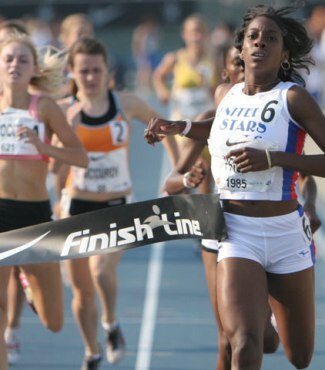 Chanelle battles the big girls at the USATF Senior 800. But did you see her on a late winter day in State College PA, as she ran in her PTFCA Indoor State Meet at Penn State University? When she went under 2:05 for the first time as part of a quadruple for the ages? Unless you live in Pennsylvania or were just darn lucky, you probably didn’t. Still, remember February 23, 2007. 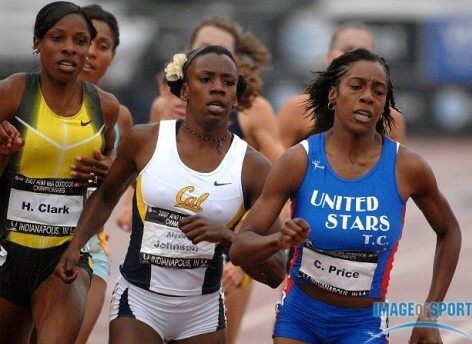 For as Chanelle Price continues on what seems an inexorable drive to the top of the track and field world, that will stand as a day when she seized the axel of her destiny and gave it the mightiest of turns. “That point,” to be specific, was the 800. It was the 2nd event of a one-day quadruple, which had begun with a measured, but hardly pedestrian 5:06.74 mile. It would conclude with legs on Easton’s 4x800 and 4x400. The goal was to get her Red Rovers the state title. While formidable rival Shaniel Chambers was hardly going to go down without a fight, Price could win the 800 with much less than an all-out effort. But in the midst of this voluminous effort would also come an all-out attempt to blow to smithereens her career PR, the 2:06.23 from the previous summer. To date her indoor best had been 2:08.47 from the previous year, but she’d also dramatically extended her national-class range with a 4:50.65 mile at New Balance, which gained her an invite to the Millrose prep mile, where she was third. On this day, it wasn’t enough to try and win the four golds and the team title. It was time to push the envelope in her signature event. It was time to get to the next level. It seems everything in Chanelle’s life had led to this point, her family life, her athletic background, the new approach to training over the previous several months, and the presence of the still-developing warrior deep within her soul. With an ex-Marine father and a mother who is a parole officer, the daughter of Harry and Yolanda Price has always had models of discipline to follow. Structured athletic activity has been a part of her life almost from the time she could walk. She began studying dance at age 3, playing soccer a few years later. The soccer coaches and some parents noticed that there wasn’t anyone else on that pitch that could run like Chanelle. “I just liked running all over the field, chasing people around,” she remembers. That led to involvement in a New Jersey track club where they lived then and eventually a 4th in a Colgate national indoor age-group race when she was seven. “I didn’t know what the heck I was doing,” she recalls with a laugh. “I know I hated to lose.” But unlike a lot of kids, that experience didn’t turn Chanelle into an age-group trackster for the rest of her youth. The dancing, soccer, and eventually hoops were big parts of her life through middle school. Chanelle’s sporting mindset has hardly taken place at the expense of the priorities of a good character and academic success that her parents instilled in her. However, she also embraced athletic training as a way of life, in an unusually strong, singular way, that cannot help but evoke thoughts of the “sports schools” in places like China. But there was no sports school (and no Communist or drug-use overtones, of course). It’s just that athletic training became almost as much a part of Chanelle’s life as eating and sleeping. Virtually always has been. 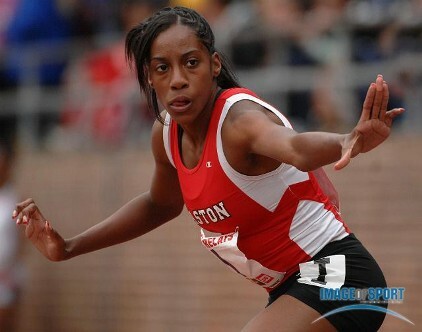 Chanelle waits for the baton at the 2007 Penn Relays 4x400. So it’s not only been the discipline and the embracing of the training mentality that this student-athlete has brought to the table, but also the relentless competitive desire fostered growing up with boys. 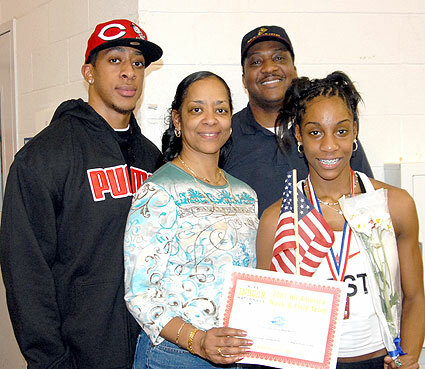 When Chanelle began to turn more attention to the sport again in middle school, and family had moved to PA, she started training with Coach Lattimore and his club. He, in turn, saw that she needed more than he could provide in Easton and directed her to Ken Abney’s United Stars in Philly. Coach Lattimore would eventually bridge the gap between the Stars, and the program and her head coach at Easton, Andy Messa. But the long drives began when she joined the Stars before high school. And, after her 8th-grade year, Mom had to lay down the law for her still seriously multi-sport daughter. Four or more things was too much. Focus on one. And she began zeroing in on her opponents. Never mind that she was a freshman and sophomore aiming at upperclassmen. Competitive desire. Hates to lose. And that was the last time Chanelle Price has lost to another high school athlete in the 800. Indeed, this is a young lady that had a lot going for her. But she and her coaches knew they couldn’t stand pat after the ultra-successful end of her sophomore year. So they adjusted the training for 2006-07. “We made up a plan where each season was different than last year,” Chanelle explains. “Cross-country was more speed-based. My mileage wasn’t very high, but I did a lot of hard miles (repeats) … all under 6:00, close to 5:30. As fans across the country would see her do in June, she left the competition in another galaxy in the first 200, getting into her zone and blasting into the stratosphere with a split just under 30, and then 400 in 60.7. She held on with the force of a steely will, hitting a pair of 32s to the glorious finish. Chanelle’s normal M.O. after a race, win or lose, succeed or fail, is to simply walk away and catch her breath, maintaining her normal, upbeat countenance, free of drama. “She believes when you are done, you should look as strong as when you started,” says Coach Lattimore. Show no weakness. But this time, when she saw the 2:04.96 on the board, she couldn’t help it. YES! She quietly, but with great intensity pumped her fist and raised her index finger briefly in the air. She had crossed the bridge. She was there. Indeed, seemingly fortified instead of fatigued by the revelatory 800 performance, Chanelle ripped a 2:08 leg in the winning 4x800 and a mind-bending 53.6 in the championship 4x400 as Easton took home the crown. It’s not easy going into a senior year with most of your competition already far in the rear-view mirror. But Chanelle has plenty to motivate her. Obviously there’s the tremendous goal of squeezing out those remaining 2.31 seconds between her and Gallagher. There’s the Olympic Trials – where she already has the “B” qualifying standard and is within 0.88 seconds of the “A” mark. But there’s also refreshing her brief international resume with the World Junior meet coming up on the calendar. At the World Youth 800, where she was surrounded by other 2:04-2:06 runners with 200 to go, she was on the receiving end of a push by Kenyan Winny Chebet that threw her out of her zone en route to a disappointing 6th – the one blip in an otherwise amazing year. Chanelle has come a long way, but pack-running is still on the list of things to perfect. “Maybe that’s what she needed to keep growing,” says Coach Lattimore. Besides cross-country this fall, there will also be the process of choosing a school where she can run and continue her education. Though there has been some talk in track circles about Chanelle turning pro at some point soon, it’s not something that she, her family or her coaches is thinking much about now. The family part of Team Price as captured by Donna Dye after Chanelle's NIN victory: brother Domenique, mother Yolanda, father Harry, and Chanelle. So Chanelle will have plenty of goals for 2008. And achieving great goals seems to be what she was born for. Yet the truth really goes beyond that. Spend time with Chanelle and it’s obvious; yes, the girl gets results. But then you see it’s the process that defines her. The adherence and love for the training routine, the thirst for the legendary workouts, the ability to be a great student, teammate, daughter and sister in the midst of this athletic drive to the top. Then when you walk away, you see even more than that. It’s the smile you’re left with, the spirit that uplifts you. Yes. That’s it. Now, finally, you know Chanelle Price.